Ice racing at the 2015 Winter Fest. Put on your snowshoes and rev up your snowmobiles: The third annual Winter Fest and Games presented by CCF Bank is coming up! From Jan. 27-29 Lake Altoona will be the coolest spot around with a flurry of events and festivities for winter enthusiasts. Winter Fest is returning to Lake Altoona, the event’s original location, after being displaced by weather issues and restricted lake use as a result of a dam repair project last winter. “I’m just excited to get it back out on the lake,” said Brian Sandy of the Eau Claire Press Co., one of the event’s primary organizers. “That’s where we shine. 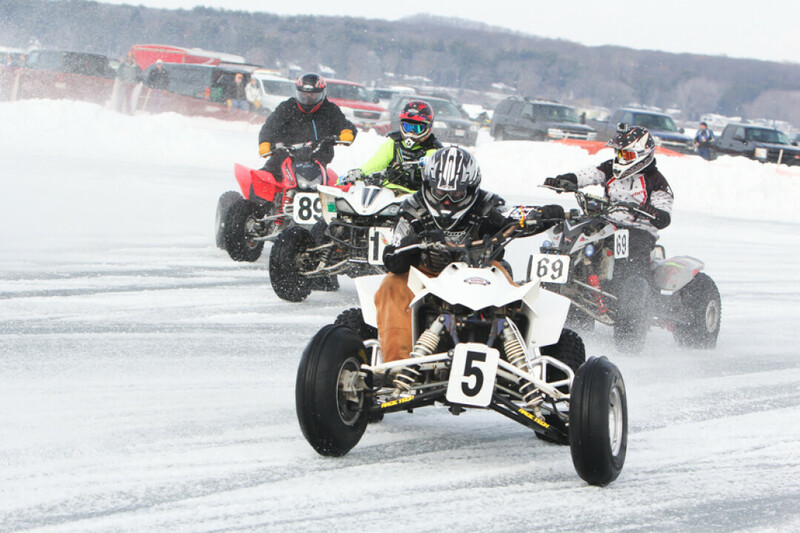 When we get good ice and everything is up and running, it’s quite a spectacle.” Through all three days, the lake will have a large oval track for ATV and motorcycle races. In addition, road course car racing and the newly added snowmobile drag races will take place. The drag racing strip is 2,500 feet and accessible for the public to race. Festivalgoers can also get their fill of competitive fun by registering for the Winter Chill Softball Tournament and the Cold & Bold Fun Run/Walk, a 5K race on the lake accompanied by a snowshoe fun walk with snowshoes provided. There will also be volleyball, pond hockey, and ice fishing tournaments; a Kid’s Snow Zone with an obstacle course and heated tents; and even hot air balloons. For a complete schedule of events, tickets prices, registration information for specific tournaments, and a gallery of photos from previous years, visit winterfestandgames.com.